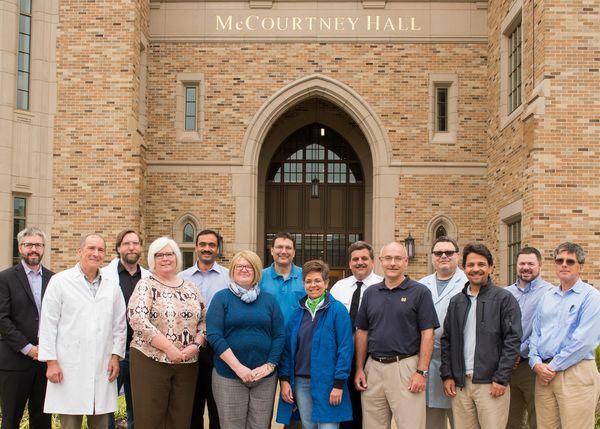 This Saturday, Oct. 28 at the football game against North Carolina State, the Laboratory Safety Advisory Committee will receive a Presidential Team Irish Award for their contributions to the research and teaching environment on campus. The University of Notre Dame strives to create a research and teaching environment in which hazards are understood and the associated risks are minimized by proper procedures, protocols, and equipment. The Laboratory Safety Advisory Committee, which is comprised of 16 members from the academic and operations units of campus, has made significant improvements in laboratory safety including improving or creating numerous lab safety programs, developing and overseeing our lab safety assessment process for approximately 600 labs, and revising the laboratory safety training process. The Presidential Team Irish Award program has been designed to provide a special and unique opportunity to publicly recognize core staff teams that exemplify the University’s Core Values on behalf of their department and the University. The recognition of a significant accomplishment, collaboration or initiative where the University’s core values are demonstrated occurs during each home football game. Originally published by Marissa Gebhard at evp.nd.edu on October 27, 2017.